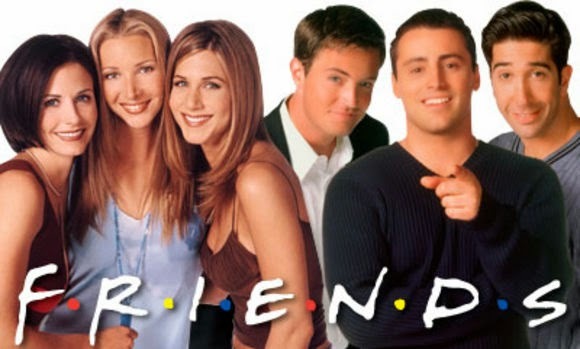 Twenty years ago this week, Friends made its debut on television. That seems crazy to me. I can remember living for Thursday nights at 7 p.m. when the new episodes were on. Like most people, I was in love with show. I was probably younger than the average demographic, but I’ve always thought of myself as on old soul so I could totally laugh at all of the naughty adult jokes. But in all honesty, it was probably the dumbest jokes of that show that I loved the most- Chandler and his W.E.N.I.S. I still laugh when I say wenis. It’s just a funny word. Joey and the mmm… noodle soup, I mean soup! I mean noodle soup! I think of it every time I go into an audition. But what Friends really did for me as a child was set up very false expectations for how I thought life in my late twenties would be. And I love them for it. False expectations are what make life interesting. And then there was the whole coffee shop hang out, Central Perk. So all late twenty-somethings go straight to a coffee shop every day after work to hang out? So awesome! I was about seven or eight and hadn’t been introduced to alcohol yet, so naturally a coffee shop after work full of delicious muffins and scones sounded amazing to me at that time. But now that I’m in my late twenties, I want to know how Chandler and Ross and Monica and Rachel (the four with presumably “normal-ish jobs”) had the time and energy to go to a coffee shop right after work. Why didn’t they just want to go straight home and put on old sweat pants and bury their face in the couch and a bowl full of Cheez-Its? Or at the very least just go to a dark bar and toss back a few? Anything but the bright and lively place that was Central Perk. Or perhaps I’m just being a cynical late twenty year old right now. And hey, if my job as a buyer fell through I could always be an actor like Joey. Remember when Joey got an ad as the STD poster boy and it seemed so embarrassing and awful? I would kill to land an ad like that today. I honestly would. His face was everywhere! You can’t beat that exposure as an actor. You gotta start somewhere. Remember when we all thought apartments in NYC were just like the Friends set? That was fun. Let’s go back to that time in life when I assumed all New York apartments were massive and all dorm rooms were just like the ones from Save By The Bell the college years. I remember thinking Joey and Chandler’s apartment across the hall was icky, I’m pretty sure to have that icky apartment you’d have to be a millionaire. And to have Rachel and Monica’s you’d have to be a trillionaire. Never the less, I still long to someday have a door with a picture frame around my peep hole. All in all, Friends made me believe my greatest worry in my late twenties would be dating. Forget student loans, or finding a good job, or being able to pay rent every month, going out on dates (and not ending up in lingerie in front of your boyfriend’s parents) is the only thing to worry about. If you can figure that out, everything else in life will be okay. Does that seem like something you can do, DOES IT? Previous Post: « I’m a Graduate!